Chocolate is commonly used for many celebrations around the world; in cakes, as gifts and as special treats to reward yourselves for good behaviour. It’s sweet and decadent flavour makes anyone blissful eating it. So, why not indulge your guests and add a touch of decadence to enhance your special day or event with one of The Candy Buffet Company’s delicious and mouth-watering chocolate buffet tables. As most of our clients say, it’s the ULTIMATE chocolate experience. Our beautiful bespoke tables can act as a stunning centrepiece to your room, and can be completely customised in your theme with the full set up and dismantle included in the price. The chocolate loving guests (almost everyone) at your event will be thanking you for such a lovely delight as each person will receive a candy box to fill up with a taste of the 13 variety chocolate selection containing premium quality chocolates to complement your chosen colour scheme or theme. Hiring a chocolate buffet with The Candy Buffet Company is simple, stylish and a contemporary addition that is suitable for any special occasion or event. Many clients use our candy buffets as a decoration/bonbonniere for their events as firstly they are so pretty once all set up and the best centrepiece to your event as a stunning backdrop for your photos and secondly everyone gets to take a gorgeous little candy box home with your event information personalised on the sticker! So in saying this, the service we offer is basically a 2 for 1 – who wouldn’t be interested in that? It’s totally cost-effective and one of the best things about having a candy buffet is looking around the room and seeing the sheer joy on your family and friends faces as they indulge themselves in your decadent chocolate buffet! We will also create custom chocolate bars for your wedding. See more examples here. We offer an exquisite selection of 13 varieties of mouth-watering, premium quality Milk and White Chocolate options including malt balls, honeycomb, chocolate raspberries, chocolate bullets, chocolate almonds, rocky road… the list goes on. All of the delicious items are superbly presented in our gorgeous apothecary jars with height risers chosen in your desired colour and pattern to match your theme. The stunning table display is pure indulgence and not to mention a little guilty pleasure for some of us 😉 Our chocolate buffets create an everlasting impression on your guests and from experience, will be remembered and talked about for months after the event. If you have never seen people interact with a chocolate buffet, then we will give you a tip. The term “kids in a candy store” comes to mind when you see grown adults loading up box fulls of chocolate that barely gets to the exit before being devoured. The oohs and ahhs of your guests are a pure delight – remember that because guests take it away as a favour, they will continue to gorge themselves on your chocolate buffet in the coming days and reminisce about the night. A chocolate buffet requires a lot more than just the snapping up of a few family blocks of cadburys and chucking them in a bowl. A chocolate buffet requires thought for both presentation as well as its contents. The Candy Buffet Company has a reputation for delivering top quality chocolate buffets through detailed consultation with its clientele that leaves your wedding, birthday or corporate event in raptures. And a chocolate buffet is comparatively cheap when compared to other culinary design options. We at The Candy Buffet Company take great pride in our work and our dedicated and experienced staff will endeavour to cater for your individual requirements complimenting your colour scheme and/or theme where possible. We will strive to please and exceed your expectations. 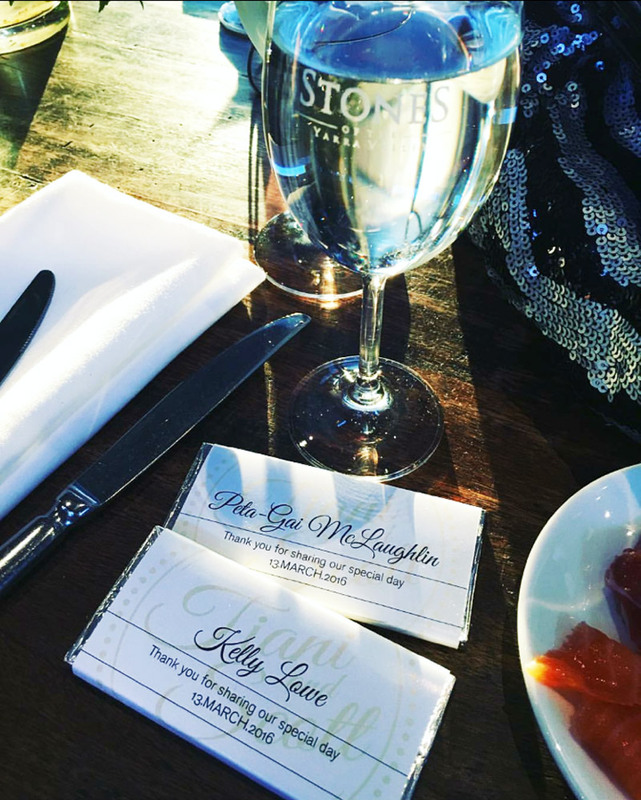 Whether you are an all round chocolate lover, organising a wedding, corporate function or a special family celebration, our philosophy is always the same – we offer a high quality personal service, one you would enthusiastically recommend to others. The Candy Buffet Company has delivered a chocolate buffet to such notable corporate events as The Hawthorn Football Club Annual Fundraiser, The RSVP “After Dark” Party and the Mary Poppins Launch Party. If you are looking to impress your guests with the latest culinary trend, then the chocolate buffet is for you. All boxes or chocolate bags can carry your company logo giving your branding extended exposure over the following days as guests continue to enjoy the chocolate buffet. Want to add the icing on the cake for your chocolate buffet? You can also hire a chocolate fountain for your centrepiece through us to create a luxurious and mouth-watering memorable display. The Candy Buffet Company is Australia’s chocolate buffet professionals. To discuss your corporate event, please contact The Candy Buffet Company today. It’s a modern dessert idea that people go crazy for, even those without a big sweettooth! The chocolate buffet proves to be a great conversation starter, no matter what the event, you’ll have everyone lining up for a treat! 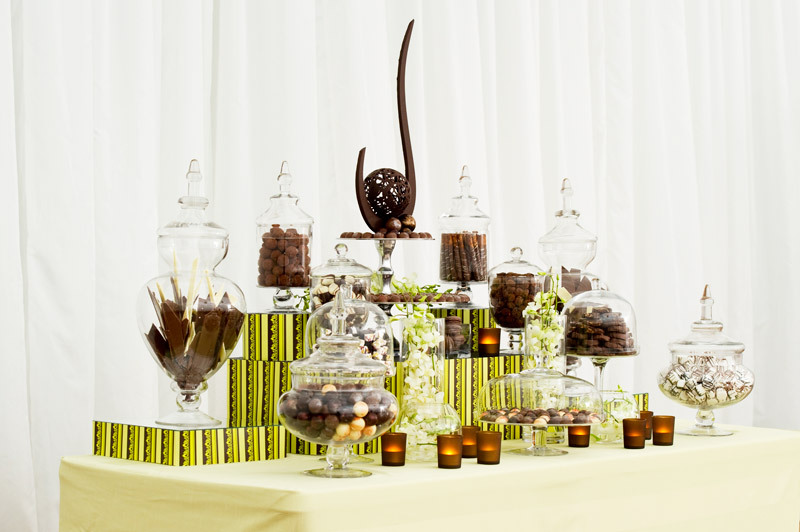 The Candy Buffet Company’s seamless process includes the entire set up and dismantle of your chocolate buffet at your venue, classic apothecary jars, plus all the utensils that will be required for your guests to help themselves. To speak to one of our buffet stylists and receive a quotation for your chocolate buffet please contact us on 1300-924-427, or alternatively you can send us an enquiry here. Wow – what an impact. We had an elaborate, traditional Christmas theme with two separate guest groups; our Candy Buffet needed to cater for kids first, then for adults two hours later. The Candy Buffet Company was completely on my wavelength and did two gorgeous designs, turning the buffet from a fun, kid-friendly Christmas Candy shop to a sophisticated, decadent chocolate installation suitable for adults. Our guests loved it. I highly recommend the The Candy Buffet Company to enhance an elaborate theme, or indeed as a standalone feature to set the scene for any event. It is just gorgeous and it smells so good! Ten out of ten! Just wanted to thank you for your support and onsite delivery last Friday for our Ace of Hearts gala event at Sketch, Docklands. The candy buffet was set up beautifully, with the chocolate fountain being a favourite amongst guests. To get the candy out we made candy bags and handed them out on the night J Will pass on the photos once we have the images from the photographer. Once again thank you and will definitely keep you in mind for any future events we have. The Candy Buffet Company was a pleasure to deal with and came up with amazing ideas that she then turned into a reality. Our Candy Buffet was definitely a highlight at our Christmas Party when they delivered an amazing Charlie & The Chocolate Factory Candy Buffet complete with a chocolate river, and exceeded our expectations.